Pawprints UK was launched to offer a professional and reliable pet service. We cater for all your pet's needs and offer tailor made packages to suit. 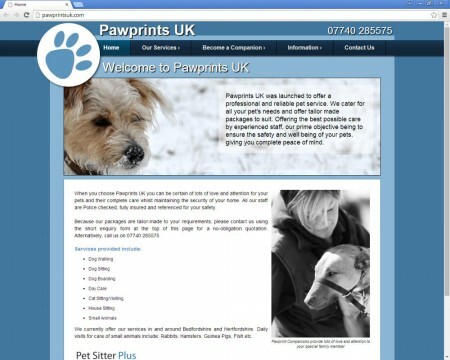 On the face of it, PawprintsUK web site is really simple. But... it's also really elegant and is one of our favourite in-house designs. The client passed up a brief outline and specification but it was down to us to turn it in to reality. Who Are We? Where Are We? What Do We Do? and How Can You Contact Us?